Consistent use of kratom in high quantities has the potential of leading to addiction and tolerance. It is the same kind of effects seen with opiates and stimulants. This is problematic to people that have been using the plant for some time, and now they want to quit. It is essential to know how the development of dependency and tolerance occurs so that you can be able to quit kratom without much issue with the withdrawal symptoms. One of the main reasons why kratom can end up making users dependent on that it `can stimulate the release of dopamine in the brain. Dopamine is a chemical compound in the brains that acts as a neurotransmitter making you feel good and full of morale. Its a critical for the brains reward system. For example with dopamine, it is released upon eating your favorite food or watching your favorite TV show. Since your brain enjoyed this activity so much, it will make you repeat this for the same pleasurable release. It is in this case that people take more kratom for that euphoric feeling and all the pleasurable feelings and benefits. However, what if you were to cut that pleasure supply source suddenly? You are likely to feel a whole rollercoaster of mixed emotions and have a craving for kratom making the entire process of quitting cumbersome. Also, this plant works on other different brain receptors which are perhaps the main reason why it is advisable not to quit cold turkey. Of course, that is if you want to avoid the withdrawal symptoms of kratom. Aside from dopamine, another reason for the dependency, and most of all, why people experience various withdrawal symptoms has to do with active alkaloids called Mitragynine. It is these very receptors that are now used in quantifying kratom for different individuals. And the moment you suddenly halt the use of kratom, you automatically trigger your brain to respond in the form of withdrawal symptoms. The reason for this is because the receptors in your brain are deprived of the stimulants they were used too. However, quitting kratom without having to go through harsh withdrawals is possible. For the reduction of your current dosage of kratom, the best approach is to cut down slowly to give your brain sufficient time to adjust. You might also have to make changes to how you ingest kratom and opt for other methods. Take the example of one who is used to a daily dose of 10g of kratom. This amount can be reduced to 500mg instead of having to take a full 10g dose. Do this gradually, and in less than a month you will have effectively and painlessly quit kratom. With this method, your brain can adjust slowly enabling you to get away with 9g minus the harsh withdrawal symptoms. By carefully cutting doses strategically you’ll eventually find yourself needing 3g or less to even nothing at all. 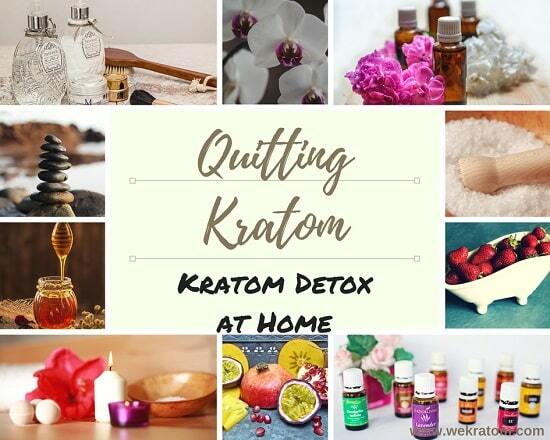 This is the most effective way to quit kratom. The thing is, with every individual comes to their way and amount to cut off as it is also dependent on one’s dependency level, etc. A good starting place for most people is 300mg- 500mg. After this, the next step involves detoxifying your body and mind. All in all, they are efficient and applicable ways to go about it at home. A rehabilitation or detox facility is often the last resort for most people. This is okay as there are ways to safely detoxifying at the comfort of your home. Since the effects of Kratom are opioid-like, the withdrawal is more like that seen with opioid withdrawal. Having established that, below are what American Addiction Centers has set as standard treatments to help in the management of withdrawal symptoms like cold and flu. Substance withdrawal may subject the body to experiencing many nutritional deficiencies. Studies have shown that people with opiate addiction suffer from a lack of magnesium and calcium contributing to muscle spasms and muscle pain. A deficiency of potassium also leads to Restless Leg Syndrome. It is recommended to have light, healthy meals for the improvement of nutritional balance. You can also supplement deficient areas or even take a multivitamin which helps in easing the symptoms and speeding up the recovery process. In extreme cases, the withdrawal symptoms may include diarrhea and sweating excessively. This can make someone dehydrated. To prevent the discomforts that are associated with dehydration, it is vital to drink a lot of fluids. Sports drinks are best for this purpose as they help a lot in restoring lost electrolytes. Withdrawal symptoms such as muscle pains, back pain, and headaches are often experienced by many people who are recovering from substance abuse. It was reported that having a hot bath can improve these withdrawal symptoms. The soothing experience felt from being soaked in warm water can help someone to sleep. You can also add Epsom salt to the warm water as it is useful in soothing sore muscles. During feverish periods, hot baths should avoid, and in its place, you can use a heating pad effective in helping to soothe aching muscles. There are some situations where it may be necessary to resolve to over-the-counter medications to relieve some withdrawal symptoms. For example, diarrhea can ease with the use of Imodium (Loperamide). As for muscle aches as well as pains, topical analgesics such as ibuprofen may come in handy. For insomnia, melatonin is an excellent example of a natural sleep supplement you can use. Some people get overwhelmed by withdrawal symptoms. In this case distraction through entertainment can be a source of relief from the various discomforts that come with the detox process. Comical relief comes in handy because laughter can also help in promoting the release of endorphins. Therefore it is recommended to read books, watch movies and spend a good amount of time with friends. While doing all these go for comical relief as it is very effective in acting as a necessary destructor helping forget your symptoms. Quitting kratom is as difficult as quitting any other substance abuse. It may take a while particularly for those who have used it in high doses for a long time but bottom line going back to sober living is possible if you put this information into consideration.